Your very interesting website has been pointed out to me, and I thought you might like to include a biography of my father, Edward J. Kelly, who was buried at Arlington National Cemetery on 27 March, 2003. At the time of his death, he was the longest-serving employee in the Department of Defense (61 years continuous service). He never retired at was greatly respected by his colleagues at HQAMC even at the age of 85. Edward Joseph Kelly, 85, of Fairview Heights, Illinois, died Friday, March 14, 2003 at Forest Park (Deaconess) Hospital, St. Louis, Missouri, after a long illness. Kelly was a Command Policy Specialist for international airlift and airspace agreements at Air Mobility Command, Scott Air Force Base, Illinois. He completed 61 years of continuous service to the United States Air Force, making him the longest serving employee in the Department of Defense. In 1998, he received a special Presidential Commendation for his continuing outstanding service to his country. His active duty service in the U.S. Air Force spanned World War II, the Korean War and the Vietnam War. Edward J. Kelly was born into a prominent New England family on January 23, 1918 in New Haven, Connecticut. He was an athletic young man who played hockey professionally for a brief period in 1937. In late 1940, he took a job at the Sikorsky Aircraft Factory in Stratford, Connecticut, working with “Old Man Sikorsky” on the Corsair Naval Fighter and on the development of the helicopter. In January, 1942, he volunteered and was accepted into the Aviation Cadet Program of the Army Air Corps, but was drafted into the Army before his application could be processed. He completed infantry training in the U.S. Army and was assigned to the Corps of Engineers and then the Calvary before his application to the Aviation Cadet Program was finally recognized. In the course of World War II, he flew the entire gamut of the Army Air Corps multi-engine aircraft in all theatres of the war, including the famous B 24 Liberator, the B 17 Flying Fortress, as well as the B-25, B 26, C 46, C 47, C 49, C 87, and C 54 aircraft. He flew 87 combat missions in the treacherous China Burma India Airlift across the Himalayas, delivering food, arms and supplies to the Chinese Resistance. Kelly was reported Missing in Action twice and Killed in Action once. Among his Military honors and awards were two Distinguished Flying Crosses, three Air Medals and the Air Force Commendation Medal. In the course of his Air Force career, he accumulated over 13,500 hours military flight time in some 50 types of aircraft. After the war, he became a military prosecutor (JAG) in the military court of Brookley Field, Alabama, and continued flying a variety of military transport aircraft. He was directly involved in the famous “Operation Little Vittles” of the Berlin Airlift, organizing the thousands of handkerchief-parachutes and Hershey bars that were dropped to children on the ground in Berlin. 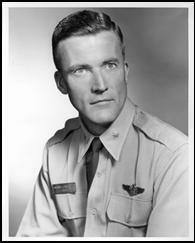 He was later stationed at Hickam AFB, Hawaii, where he studied at the University of Hawaii in addition to his flying and JAG duties; Great Falls, Montana; Travis AFB, California, where he piloted legendary aircraft such as the C 124 Globemaster II, C 97 Stratocruiser, C 119 Flying Boxcar and C-133 aircraft; and Keflavik, Iceland. In 1965, Col. Kelly retired from the U.S. Air Force at Scott AFB, Illinois, where he was Operations Officer of the Military Air Transport Service (MATS, today AMC), and was hired by United Airlines as a Boeing 727 Training Captain. When asked to return to the USAF as a civilian employee in 1966, he gladly consented, choosing to remain within the military family that had always been his home. Even at the age of 85, he was a greatly respected and warmly revered authority on air transportation who was credited with helping to achieve some of the organizational milestones of military air transportation, including the creation of the U.S. Transportation Command. He was the only USAF employee to have served continuously from the days of the Army Air Corps Air Transport Command through the creation of the United States Air Force in 1947 and the ensuing air transport commands, MATS, MAC and the present Air Mobility Command (AMC). He never retired. Edward J. Kelly loved helping people succeed, and he consistently put the advancement of others ahead of his own career. He was admired by his co-workers as a “wise mentor, friend, and pillar of wisdom”. All who had the honor of knowing him have been forever touched by his immense integrity, warmth and kindness, and by his subtle, optimistic sense of humor. He will be deeply missed. He is survived by his wife, Reba Cooper Kelly of Fairview Heights, IL; his daughter, Reba Kelly Phillips of Collinsville, IL; his son, John Edward Kelly of Germany; and his sister, Eleanor Kelly Flynn, of West Haven, Connecticut. Funeral Services: 8:45 AM, Thursday, 27 March, Fort Myer Chapel, Arlington National Cemetery, Arlington, Virginia.